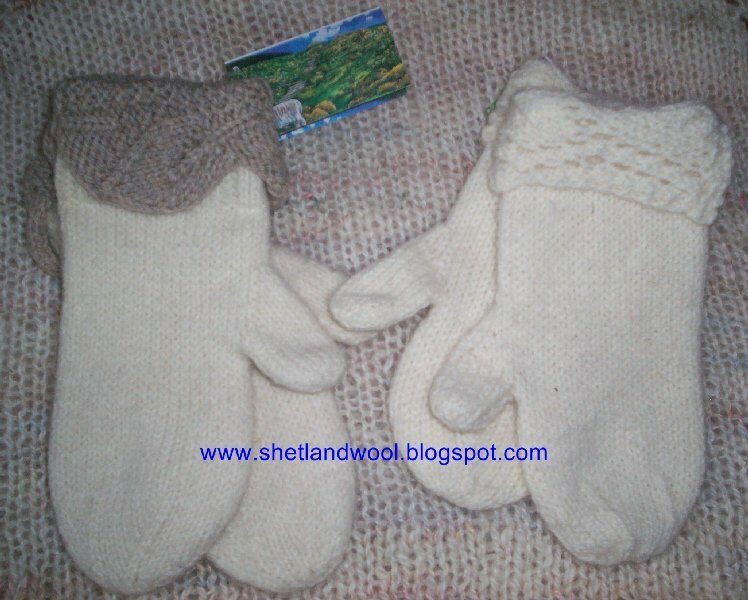 Felted shetland mittens with lace cuffs ! Giveaway for February 2013.......i know i was supposed to be showing the shetland shawl but just have not had the time to clip and spin the wool. We are so busy in the mill working on 100% qiviut yarns, machine knitting orders and all the packing and shipping ! 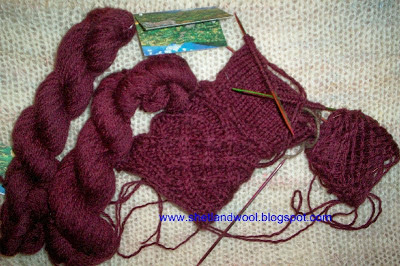 I hope to be able to have the shawl kit ready for the April Blog entry so do check back for that its worth the wait !!!! 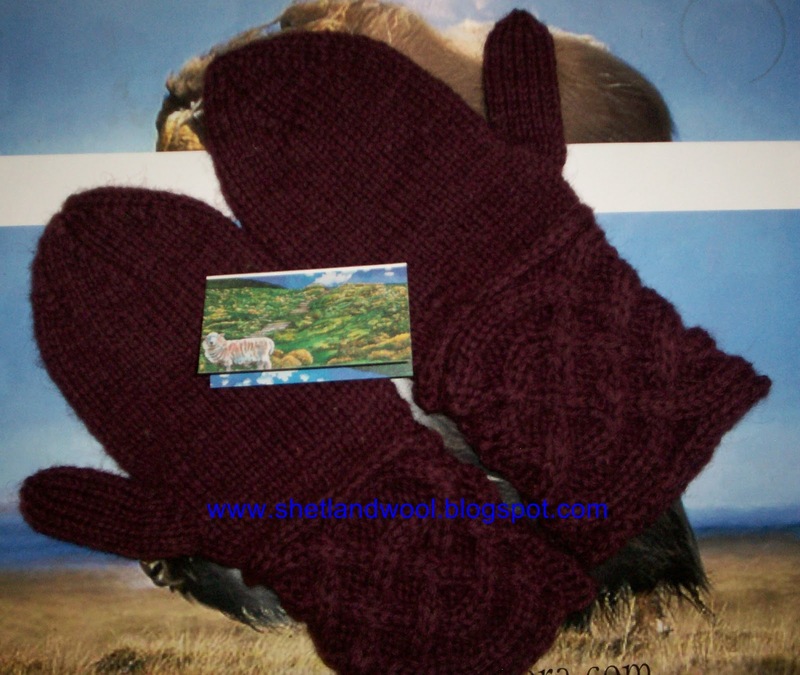 All is not lost though, i have managed to work on these mitts from 100% shetland wool in this lovely 3ply in Rich Bordeaux......i Love how the natural Shetland wool takes the dye. Colours are clear and bright with wonderful stitch definition ! The mitts at the top are knit from Natural white shetland 3ply yarn with a little bit of fawn.....got no white left until i clip my shetlands on 24th feb ! 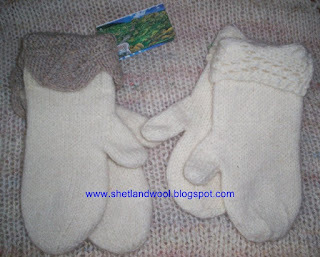 The mittens are very thick and sturdy. I'm knitting them with 2 strands of 3ply held together and will soften up after i throw them in the dryer for 15 minutes on MED heat setting. Wool developes a lovely soft halo after you break down the fibers a little. The Bordeaux is working out wonderfully......and the colour does not bleed at all ! For the past few months i have been trying different dye/heat methods to get as many of our yarns as possible to be colourfast and i think i have cracked it.....less dye, more heat and 7% Vinegar solution. These will be perfect to wear while walking the dogs. they are quite thick and heavy i'm sure the wind will not pass through them ! FROM: 08th Feb TO 28th Feb 2013. Two winners will be dreawn at random. In comments section simply tell us what colour yarn you would like in your kit ! Open to knitters world wide.....best of Luck ! OMG!! Those are gorgeous!! I'd like Mahogany with Bordeaux cuffs please!!! I love Reds, wo either the Egyptian Red or the Turkey Red! Too many beautiful choices! Bordeaux with Raspberry or Slate Blue? Or Purple with Slate Blue. Or Slate Blue with Hunter Green! For cabled mittens, I'd choose Slate Blue. Hard choice, but I think I would go with Hunter Green! I would definitely go with Bordeaux! So many colors to choose from, I like navy blue the most. oooooh! Hunter green, although it's a very difficult choice. Thanks for great giveaways. So pretty. I think I would like the Turkey Red color! A warm color for warm mitts! Ooooh a difficult choice, but I really love the Hunter green. Thanks so much for the chance. Wow it's so pretty! I would love to have navy blue! Thank you! I think navy blue would be beautiful. Thanks so much. I really like the hunter green and slate blue. Ohh the Bordeaux is my favorite, but they are all beautiful! The slate blue is lovely! I would love a pair in the Egyptian red! So beautiful, there is no bad choice; but I would love the hunter green. Your yarn sounds yummy! please let me win either the Bordeauz or the Egyptian red. Oh, I love the Hunter Green. Would make a beautiful Smokering. Egyptian Red, Raven Black ~ all-any ~ gorgeous mittens! seductive yarn pictures! then I would NEED to purchase the same colour for a cowl or scarf, and then...what delightful dreaming! ooh me! pick me! Mahogany please. I'm hegglehog on Rav. Love the mittens, especially would love them in Hunter green! wow - I am loving the slate or the bordeaux - both are so lovely, and those mittens are gorgeous! love the raven and mahogany! wonderful for cold maine winters!!! Love the richness of the bordeaux colour. And cables are always a favourite. Amazing!!! HUNTER GREEN with the lovely featured pattern, please! I would love the raspberry!!! :D Your yarns are so wonderful! I would love to have a pair of those in black or Bordeaux (or both) You have lovely, rich colors. I am a Shetland sheep breeder and lover too. Actually, it's more of an addiction that I don't see going away anytime in the near future. I have a flock of approx. 40 Shetland sheep in Monroe, WI USA. Found you on Ravelry, so I slipped over to check out your blog, please feel free to check mine out at www.okacres.com. Wow! Any color would be wonderful! Thanks for the chance. I got my package today; thank-you SO much! 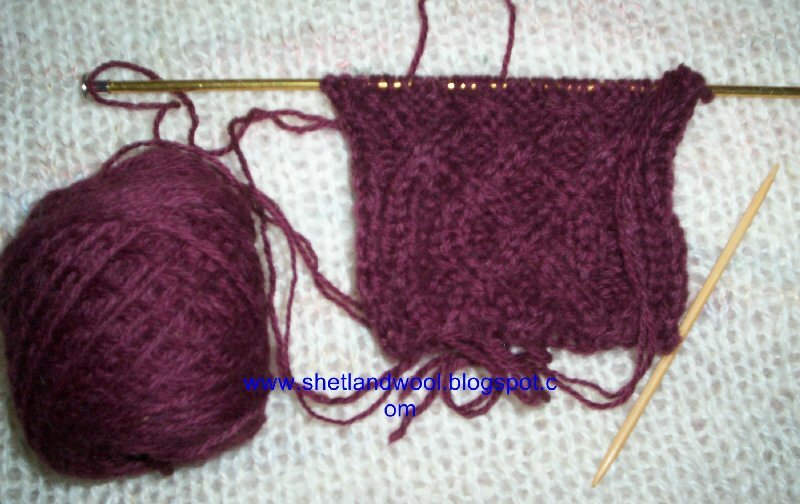 The Bordeaux is a beautiful, rich color, and I'm looking forward to knitting with it!